The Dramatic Universe builds an account of the significance and purpose of man’s existence on the earth, revealing a great task that necessitates a two-way communication with Higher Intelligences. The four volume work is a complete journey through J.G. Bennett’s search to give expression to the systematisation of the whole Universal drama. *Volume I will arrive in a separate shipment. Spanning fifty chapters from 'Points of Departure' to 'The Next Age of Mind', the Dramatic Universe provides a total unified picture of Man, the World, and God by synthesising the three domains of fact, value and harmony. This is achieved through a framework of determining conditions postulating Being time as Eternity, and Will time as Hyparxis. Complete self-development is needed in order to fulfill our destined role in the spiritulisation of existence and this, in turn, requires fulfilment of our potential in being and our development of will. Man's 'eternity blindness' is the cause of our inability to perceive potential and to experience how to participate fully in the Great Work. 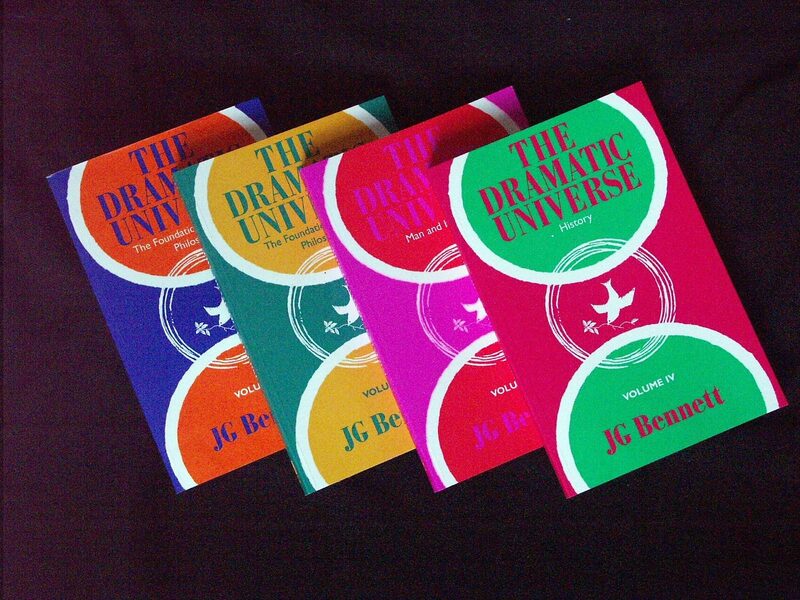 Question l. Why do you call the Universe 'Dramatic'? Question 2. How does hazard come in? Question 3. What do you say about time? Question 4. What are 'levels of being'? Question 5. What is Being beyond Life? Question 6 The biosphere is made of living things; so how can you say it is beyond life? Question 7. What is it all for? Has the world a purpose? Question 8. You said that eternity is not mystical. Do you believe in an Unseen World and if so do Values come from that world? Question 9. What have we to do about values and the World of Values? Question 10. What does our choice lead to if we can do so little? Question 11. Is the "Greater Will" you refer to the same as God? Question 12. Can we all help? Question 13. What is this self-development? Question 14. How does all this relate to the Dramatic Universe? Question 15. What are different actions? Is the difference in what people do or how they do it? Question 16. What is the connection between energy and will? Question 17. What is the reason for man's existence on the earth? Question 19. How did man appear? Is he just an animal? Question 20. This all sounds like the Book of Genesis brought up-to-date. Do you also believe in the fall of man and original sin? Question 21. How did civilizations arise? Question 22. How did the great religions come? Question 23. You seem to propose a naturalistic account of the origin of religion. Do you then reject Revelation? Question 24. Do you also reject belief in Heaven and Hell? Question 25. What do you make of the present state of the world? Question 26. Why are you so optimistic about the future? John Bennett's classic account of an extraordinary life, his meetings with many of the most remarkable figures of the 20th Century, including Gurdjieff, Ouspensky, Pak Subuh, Idries Shah, Shivapuri Baba and Hasan Shushud. This digital edition includes introductory material from the author's family.